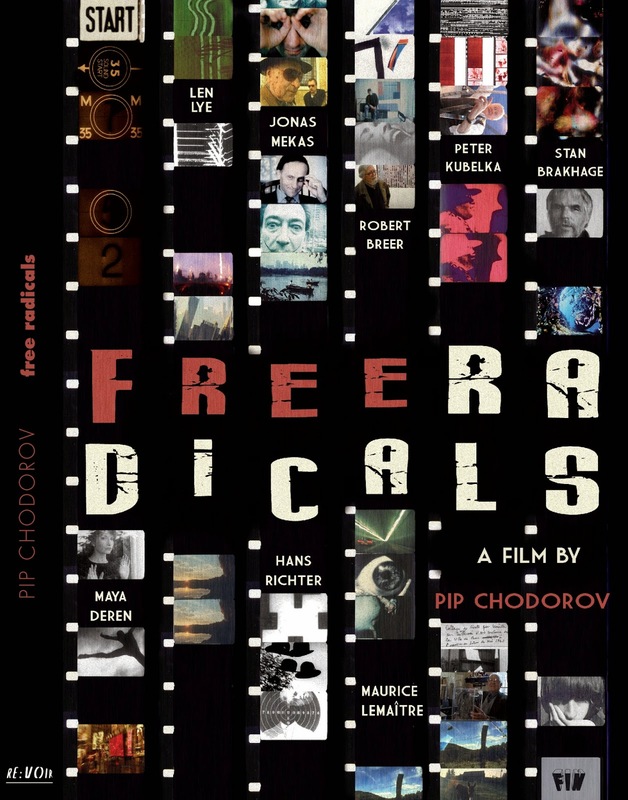 RE:VOIR est fier d'annoncer le nouveau DVD "Free Radicals - Une histoire de cinéma expérimental" de Pip Chodorov. Le DVD comporte 8 films bonus des cinéastes expérimentaux et sous-titres en 8 langues (FRANÇAIS, ESPAÑOL, SRPSKI, ČESKÉ, LIETUVIŲ, 中文, 日本語, 한국어). Le DVD contient également un livret de 56 pages, avec articles écrits par Jonas Mekas, Scott Hammen, Raphaël Bassan et Nathaniel Draper. "Free Radicals" était projeté dans plus de 50 festivals internationaux et sorti en salle en France, aux Etats-Unis et Canada. Here is a film that shines with its cast: Hans Richter, Maya Deren, Stan Brakhage, Jonas Mekas, Maurice Lemaître and other “star” experimental filmmakers (mostly Americans, up through the ’70s) parade in majesty. They do so with no false modesty (their candid-ness and confidence are rather surprising, sometimes humorous), and with a clear pleasure at having their turn in front of the camera, to be projected and listened to. Voilà un film qui brille d’abord par son casting : Hans Richter, Maya Deren, Stan Brakhage, Jonas Mekas, Maurice Lemaître et d’autres cinéastes “stars” du cinéma expérimental (surtout américain, jusqu’aux années 70) défilent ici en majesté - sans fausse modestie (leur franchise et leur aplomb sont au contraire étonnants, parfois drôles) mais avec le plaisir manifeste d’être â leur tour enregistrés et projetés, entendus. Free Radicals keeps hope alive that the voice of the ragged and wooly non-conformist might still break through the deafening roar of blockbuster films. 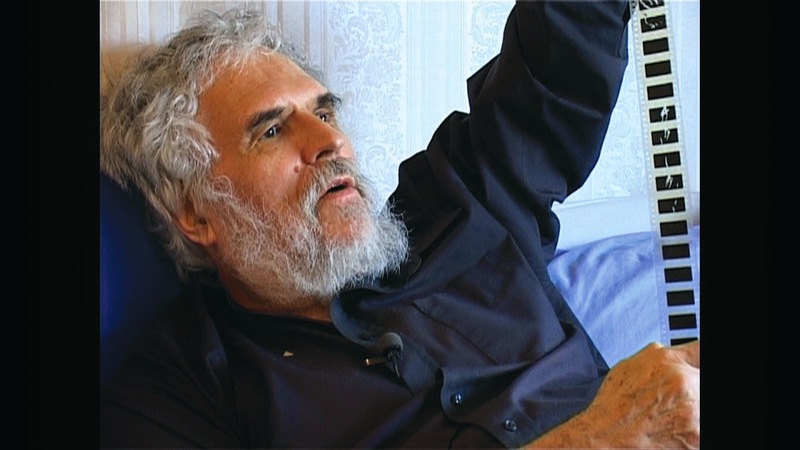 A personal window into the history of experimental cinema, Free Radicals is a beautiful essay from a film community insider: a love letter to experimental cinema and its makers. Touchant et personnel, ce documentaire qui servira de guide à tous ceux que titille le désir de plonger dans cette époque, en prolonge la démarche. Les “radicaux libres” auxquels le titre fait référence, ce sont ces artistes qui ont tiré, dans les années 1920, puis dans les années 1970, le cinéma vers la poésie visuelle expérimentale. [...] Il rend un bel hommage à cette frange du cinéma trop souvent réduite à une citadelle hermétique alors qu’elle est plutôt un espace ouvert à tous les vents, où le hasard, le bricolage, et l’humour ont souvent joué un grand rôle. 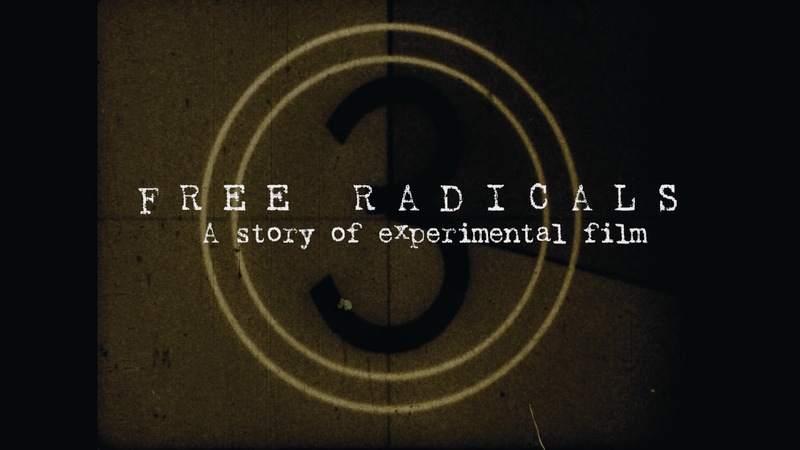 FREE RADICALS: a film about film. In 2003 I saw Wim Wenders’ “The Soul of a Man,” an homage to several of his favorite blues artists from the 1920s and 1930s. Although they changed the face of contemporary music as we know it, these influential musicians died unknown and penniless a half a century ago. I thought someone should do the same for the early pioneering experimental filmmakers, while they’re still alive. Cinema as a technology was invented by amateur experimenters, from Marey, Muybridge, the Lumière brothers and Méliès to Godowsky and Mannes who invented the Kodachrome color process in their parents’ bathrooms. The earliest experimental films were made by established visual artists who wanted to play around with a new medium. Like Wenders’ blues artists, these pioneers remain unknown for the most part. The film industry makes its profits by producing and distributing narrative films and documentaries that are seen widely around the world. 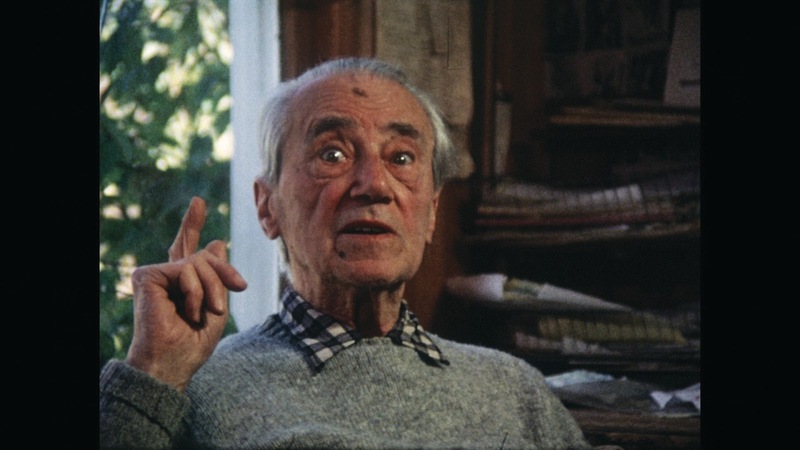 But the artists and poets of experimental cinema continue to this day to create a huge body of rich and influential work that is rarely seen or distributed. The generation of filmmakers I chose to showcase in “Free Radicals” pushed cinema into new dimensions and directions between the 1920s and the 1960s, influencing each other and the filmmakers of today. They were completely free and they had a radical new approach to cinema. They also influenced commercial film directors, advertising agencies and television producers. Although they are heroes for many, there is still little awareness of their work by the vast majority of film audiences, film students and professors, artists, art critics, curators and the general public. Their innovations can often be felt, just under the surface of mainstream media. What is experimental cinema? It is an approach, an attitude, an independent, personal vision, a pure expression of light, color and movement, poetry. It can be abstract or figurative, filmed with careful preparation or spontaneously, shot by the filmmaker or worked together out of found strips of film. Why is it called experimental? Nobody knows: you would never call a painter or a sculptor experimental no matter how experimental they are. In the 1920s, artists using film were interested in an exciting new technology. Time and movement offered the painter or the photographer new creative possibilities. Einstein’s theory was hot off the presses and there was a new paradigm for the space/time continuum. Also, Europe had just come out of a devastating World War I – the artists wanted the world after the war to be radically different from the world before the war, so they experimented in all forms. The new art form of cinema offered the artists the most creative and playful opportunities of their time, much like “new media” today. Filmmakers continued pushing the art form of cinema into wild new directions throughout the century. Cinema was integrated into artistic movements like Dadaism, Surrealism, Letterism, Fluxus, and then created its own movements like structural cinema, materialist cinema, found footage or diary film. Each artist brought his or her own personal vision to the art form but also to the technique. Some built animation machines, some mixed their own chemicals or used non-standard processes, some even painted on film or scratched on film. Some made film with no images, or even no film! Everything was possible. Experimental filmmaking was exciting, but not well understood. Whereas a poet can have his work published in mainstream magazines, experimental films are not shown in commercial cinemas. The filmmakers found themselves excluded from the monopoly of the studio system and commercial distribution. Nobody wanted to distribute their films. At the same time, there was a wide divide between the art galleries and the art cinema. Galleries looked down on film as “show business.” Galleries could not sell films. 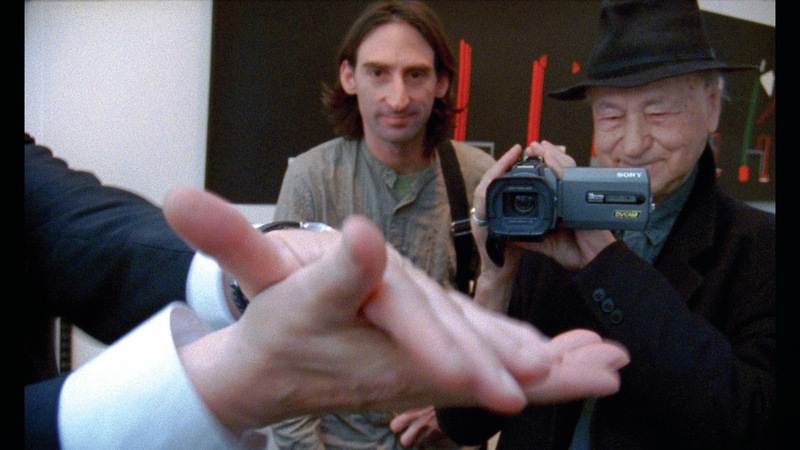 The filmmakers found themselves in a no-mans-land between the art world and the film industry. A grassroots movement developed in the early 1960s. The filmmakers got together and took matters into their own hands. 22 New York artists started the New York Filmmakers’ Cooperative in January 1962, and they were soon followed by similar artist-run distribution centers in San Francisco, London, Paris, Berlin, Toronto, Sydney, and elsewhere. Some of the groups also founded production cooperatives, pooling together processing and printing machines and creating a network of production, distribution and publication. More recently, in the past 15 years, a network of 30 independent artist-run film labs has developed around the world, allowing filmmakers to share equipment such as darkrooms, printing and processing machines, animation stands, kinescope and telecine devices, sound recorders and mixing consoles, editing tables, etc. Knowledge and online discussions are also shared between the groups, and the resulting films are distributed by the coops. Experimental filmmaking continues and will always continue, as long as people are curious and energetic enough to pick up a camera and to express their personal vision. I wanted, in my film, to document these passions and practices and the people behind them. But I wanted something else too. I am often invited to screen a series of short experimental films, at schools, events or festivals, and to lecture about the films, the filmmakers, film technique, theory and history. I can only do that so often, and for relatively small audiences. I thought it would be more effective to make a film that I could send instead of myself, a film that would include short films, interviews, explanations, and that could replace my lectures. In this way the film could be shown to many more people many more times and even long after I’m gone. The idea then was to include a number of short films in their entirety, rather than clips. It was necessary to get the rights to those films, as well as the best original material. These films were made in the 1920s, the 1940s, the 1960s and many of the prints are in poor condition. I also wanted to make this film on film: 35mm. As a video publisher I am frustrated that these films are often seen by young audiences on DVD or videoprojected. The films can only really live in their true material, celluloid, and in a cinema rather than a home, a gallery, a museum, the internet. Many of the films express themselves through the nature of the technology – light flickering through a transparent strip in discontinuous motion, to be projected on a big screen in a dark room – and they must be seen using that technology in order to be understood. Making my film on 35mm and distributing it to commercial movie theatres would return these films-within-the-film to their rightful place on the silver screen. I set out to interview filmmakers and get them to talk about this history and about the problems that experimental filmmakers face: no audience, no distribution, no way to make a living... I had already made a number of portraits of filmmakers for French television between 2001 and 2005. They were all friends of mine and they spoke to me naturally on camera, giving the film a personable feel. Friendship also became a big theme in the movie. Last came the structure and the writing, after the film was shot! The film went through several permutations before we hit on its final form. My editor, Nicolas Sarkissian, thought it might be good to start with some of my old home movie footage: family shots from when I was a kid, including a lot of stuff I filmed myself on 8mm when I was growing up. I hadn’t meant for the film to be so personal, but I have to admit that it works. Often the most personal elements in one’s life can strike a universal chord that resonates in everybody. We are all, it would seem, tentacles of the same octopus. Six years passed from the idea to the finished film. In the meantime I made 16 other films! Most of my films are made alone, just me and my camera. I shoot footage, develop it in the darkroom, print a positive copy, maybe someday I edit it together, create a soundtrack, sometimes optical effects, a final print, etc. It is a solitary hands-on, continuous process, rather quick and very inexpensive. In this case, this film required a group effort and serious funding. It came about through enthusiastic friends who found an enthusiastic producer, Ron Dyens. His company, Sacrebleu, had only produced short, animated films. But my film was in part about short animated films. It was a first for many of us: a first feature, a first documentary. But the talents of all involved brought to the screen my life, my passion, my friends, my art, my daily universe, but also the history of a worldwide and timeless art form that never ceases to renew itself. Many people who discover this film discover a whole new side of cinema. They never imagined that such a cinema could exist. Many come out amazed and enthusiastic. If this film stirs one to see films, to make films, to express one’s creativity in any way at all, whether it makes sense or not, whether it is useful or not, whether it is acceptable in society, then it has succeeded.